A beautiful oval shaped lacy doily to decorate home. As a center piece on a table it definitely draws attention. And the flower packed border is enough to spread happiness. 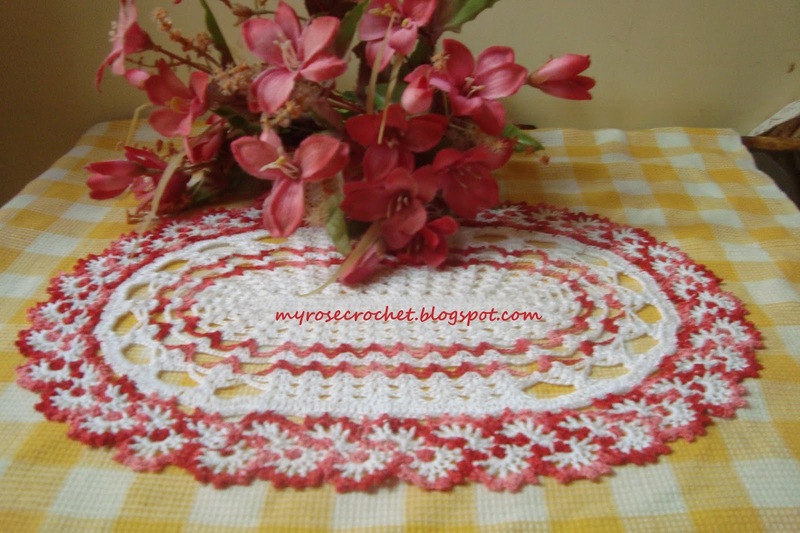 I thought for white and variegated red color for this doily. And it turned out really very enchanting. In any other color combinations will also look good. Crocheting this doily is really very enjoyable as it is done in two parts, so it is more easier. The middle doily in shell-stitch and lace border . Simple stitches like Chain, Single Crochet, Double Crochet, Slip Stitch are used for crocheting . With intermediate knowledge of crocheting and following the instructions one can easily make it. Any lace thread can be used. I used mercerized crochet thread size#20 and 0.5 /0.6mm hook . Size of this doily is 14" width and 11" in height. Pattern is in photo-tutorial, written using American Terminology.